Traffic microsimulation models are becoming widely used and valuable tools in modeling existing and planned future transportation networks and conditions. These models can help transportation professionals make important decisions on such topics as new roadway alignments and configurations, new interchange configurations and locations, the addition of freeway auxiliary lanes, work zone management strategies and plans, operational and intelligent transportation system (ITS) strategies and plans, coordination and timing of traffic signals, and the addition of high-occupancy toll lanes. Although many of the microsimulation models used today are robust and provide a wide range of analysis options, some gaps and limitations still exist that can affect the accuracy of their results. Since the 1970s, the Federal Highway Administration (FHWA) has been a leader in the development of traffic simulation models. Before FHWA undertook a leadership role, no commercial traffic simulation packages existed in the marketplace. To help achieve wider acceptance of the use of microsimulation systems and ensure the tools provide accurate results, FHWA's Traffic Analysis Tools Program launched the Next Generation SIMulation (NGSIM) program. NGSIM is a unique public-private partnership between FHWA and commercial microsimulation software developers, the academic research community, and the traffic microsimulation community. In undertaking this partnership, FHWA will act as a market facilitator and use focused public resources to influence and stimulate the commercial simulation market by fostering a cooperative environment of public-private coordination. Real-world datasets and their corresponding data descriptions. These datasets consist of detailed vehicle trajectory, wide-area detector, and supporting data for researching driver behavior. The vehicle trajectory data, which were collected using digital video cameras like the one shown in figure 2, are particularly valuable due to the unprecedented level of detail and accuracy: the precise location of each vehicle on a 0.5- to 1.0-kilometer section of roadway is recorded every one-tenth of a second. Core simulation algorithms, which are mathematical models that replicate fundamental driver behavior logic, such as how drivers follow each other or how and when drivers choose to change lanes, which are the foundational logic within traffic simulation models. The algorithms developed and validated under the NGSIM program are based on collected real-world datasets and are intended to fill the gaps and limitations of current simulation models. Documentation of the core algorithms, including the theory and logic behind the algorithms, and documentation of the validation datasets. Figure 1. This flowchart depicts the implementation of the NGSIM program. Figure 2. 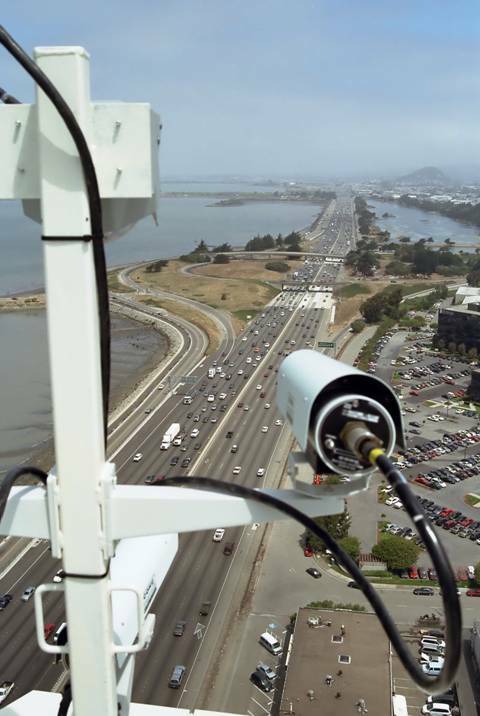 A digital video camera mounted on top of a building that overlooks a highway is recording vehicle trajectory data. From the outset, the NGSIM team sought input and advice from the traffic simulation community through the formation of three stakeholder groups that together represent the different perspectives of the community. These stakeholder groups include a traffic modelers group that represents researchers and others that develop driver behavior models, a software developers group that represents private vendors responsible for developing and maintaining commercial traffic simulation software, and a model users group that represents the practitioners who use traffic simulation models for decisionmaking. The NGSIM team and stakeholder groups first conducted a market assessment of traffic microsimulation models, including identifying their limitations and prioritizing the NGSIM algorithm research needs based on the objective of improving the core behavioral algorithms in microsimulation software. The NGSIM team then formulated high-level plans for collecting data and developing and validating the algorithms. These plans ensured that the research would be conducted through a consistent, rigorous process. The team also provided an infrastructure for free and open sharing of data by developing data formats and a Web site for online dissemination of NGSIM products. The high-level system plans and project infrastructure then enabled the team to proceed with the primary tasks of collecting real-world datasets, developing core simulation algorithms, and validating the algorithms using commercial simulation software. As a result of the core simulation algorithms developed through NGSIM ultimately being incorporated into commercial simulation models, transportation practitioners will be able to use microsimulation software more confidently knowing that traffic simulation experts developed the models' algorithms using high-quality, real-world datasets. Improving the core algorithms ultimately will lead to more reliable and valid transportation decisions, which is critical in the current environment of both shrinking transportation budgets and growing demand for accountable and efficient transportation investments. Enabling reliable and valid transportation decisions through improved traffic simulation modeling is the ultimate goal of the NGSIM program. The Turner-Fairbank Highway Research Center (TFHRC) has more than 24 laboratories for research in the following areas: safety; operations, including intelligent transportation systems; materials technology; pavements; structures; and human centered systems. The expertise of TFHRC scientists and engineers covers more than 20 transportation-related disciplines. These laboratories are a vital resource for advancing this body of knowledge created and nurtured by our researchers. The Federal Highway Administration's Office of Research, Development, and Technology operates and manages TFHRC to conduct innovative research to provide solutions to transportation problems both nationwide and internationally. TFHRC is located in McLean, Virginia. Information on TFHRC is available on the Web at www.fhwa.dot.gov/research/tfhrc. This Next Generation SIMulation fact sheet provides concise information about a TFHRC facility.